In Italy, the Kingdom of the Two Sicilies was in the forefront of philately too. 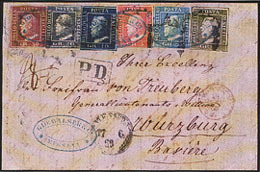 In fact, adhesive stamps were first introduced in the Kingdom under the reign of Ferdinand II [(We take this information from V. RICCHIONI “La riforma postale del 16 luglio 1857 ed i francobolli del Regno di Napoli”, in Unione Filatelica Lombarda, Selection of Collections presented to the Exhibition of Traditional Philately, MonacoPhil2002, Milan, Rome 2002, p. 187. See also: Catalogue de l’Exposition des 100 Timbres et Documents Philateliques parmi les plus rares du monde, Principaute de Monaco)]. The first proposal of such a stamp was made to the King in 1841 by architect Amy Autran, when she came back from a trip to London where she had noted that the public had accepted with favour the introduction of the first stamps. Autran prepared some samples with the face of Ferdinand II crowned with laurel in an oval frame, after a drawing by a so-called Thomas engraved by Wlliam Cave. These samples were printed using chalcography in sheets with 15 stamps each, whereas the printing was made in black, slate-blue, olive green and reddish brown. Due to the slowness of bureaucracy, a Committee to study “all necessary or useful improvements to the General Administration of Royal Mail and Courier” was established only in January 1857. This Committee worked with promptness and on 16 July 1857 Ferdinand II could issue a decree reorganising the Royal Mail. The use of stamp became compulsory for everybody and also the fee was the same for all distances, although it changed according to the volume and weight of the letter. «Moreover, the principle of uniformity was deemed as the right one, because the postal fee was seen as both a refund for a service made by the State and as an indirect taxation similar for all citizens. It was also seen as a useful principle, since it would have certainly increased the returns, and as a necessary one because this simplification would have made the use of stamps easy for everybody» [RICCHIONI, ibidem]. 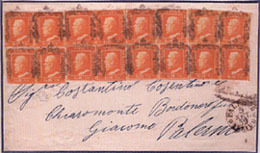 The seven stamps were said to betray a certain “monotony”, whereas on the contrary they were not like all others existing in Italy because each one of them showed a different frame. Pink was the chosen colour for all of them.